The man at left: «What a terrible failure of communism: people starving in front of empty shops!». The man at right: «...it is true, a sad failure. But what shall we say of capitalism? People starving in front of full shops!». 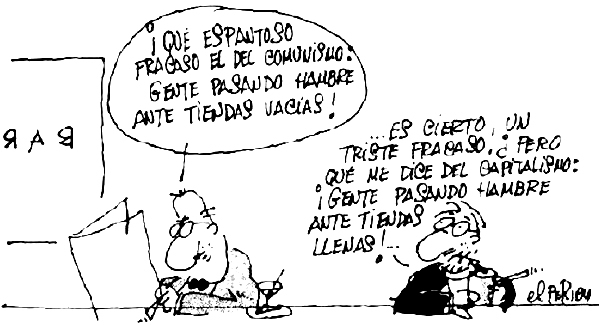 This cartoon of brilliant cartoonist and humorist Jaume Perich (1941-1995) epitomizes in a short space the fact of the two economies confronted during the Cold War (1945-1991). In the regimes of state capitalism, which we call communists, they abolished market, so the shops in charge of providing basic products to the population were left with low provisions. People had to make long queues in order to be able to buy, and if anybody wanted to buy products beyond what they had been granted with their ration card, they had to turn to the black market. Of course, the black market products were paid with anonymous money. Agustí Chalaux (1911-2006) had a saying to describe this situation: «100,000 business people produce better and more efficiently than 100,000 public officials». In regimes with private capitalism, on the contrary, the shops are full of goods, however only available to people who have the money to pay for them. The poor cannot buy in these shops, even if they have available the products they need. Aware of this situation, Agustí Chalaux used to say: «I don’t mind the rich, I mind the poor, and with them there are only two solutions: either we kill them, or we give them money, then they will stop being poor and will buy in the shops of the rich». This means that, even if we abolish the market of illicit goods, that is corruption, we must not abolish the market of lawful goods, if we want the population to get the basic products they need. But it is necessary that the poor become consumers by means of an income system which grants their basic sustenance, keeping them away from begging, from wrongdoing, from prostitution, and so on. In this way it is not only the poor to benefit of the measure, but also the shopkeepers, the middlemen and the producers. Those who criticise capitalism should be able to see the difference between savage capitalism, which started with the introduction of anonymous money, 4300 years ago, which is what should really be abolished, and a General System where capitalism is not savage, it is limited to the purchase and sale of lawful goods, and there is no poverty. It must also be kept in mind that the market must not involve the whole of society. Liberal arts, such as education and public health, cannot be brought into the trading system if the best services are to be offered, as these are often in contradiction with economic benefits. An interview with Richard J. Roberts, Nobel Prize for medicine in 1993, is meaningful in as much as he points out the difficulties of applying final solutions to health problems, because healthy people produce little benefits for the medical labs. For this reason, in spite of their deficiencies in the market, the countries with state capitalism boast that they have a more rational performance in public health and education. Commercial professions and liberal vocations must coexist within the same system, but separate from one another, and establishing the incompatibility of carrying out a commercial profession with a liberal vocation at the same time. You may find more details on publications of the life, works and thought of Agustí Chalaux.